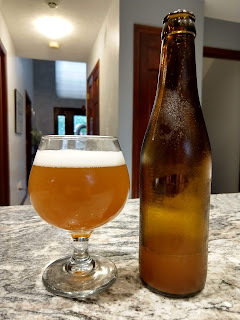 My last attempt at a Tripel Karmeliet clone used what was purportedly the actual recipe from the 1600's. The beer came out darker, heavier-bodied, and far less lemony than the actual Bosteels product. This time around, I reduced the amount of wheat and oat in the mash, and included some Simplicity candi sugar to further lighten the body. To amp up the lemony flavor, I've used a mix of Hallertau Mittelfruh and Lemondrop hops, added lemon peel, and a small amount of coriander. 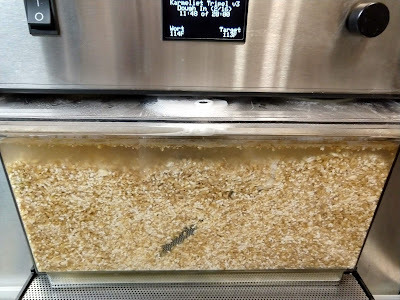 The last time around, the Zymatic had trouble dealing with the grain bill for the beer (which was a full 9 pounds - the device's upper limit). Dropping a half pound of oats and a pound of wheat got the grain bill down a bit. The gravity should come out about the same, since I've added the candi syrup to the mash water (to give it a chance to caramelize during the boil). I edited the mash schedule to dough in at 113F, which hopefully will provide several benefits. At this temperature, Ferulic Acid will be created, which can help some yeasts express their full flavor profile. 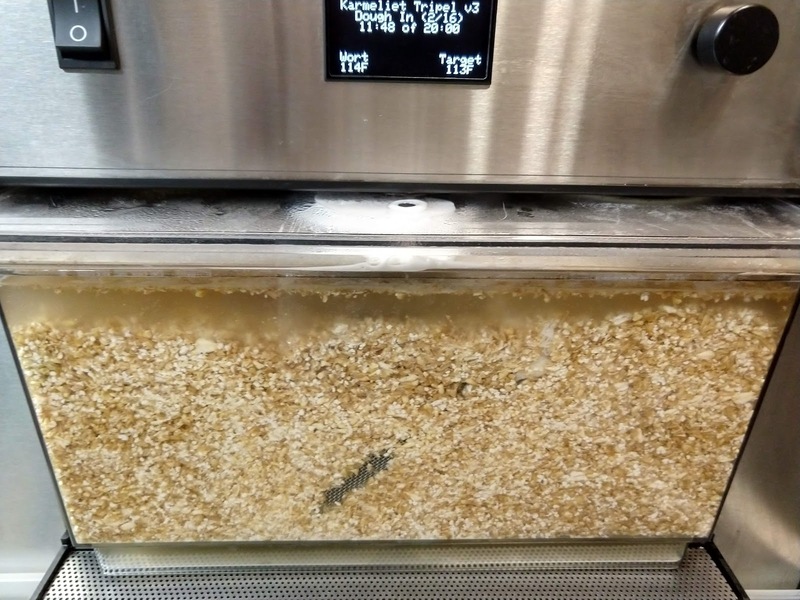 This temperature is also helpful for increasing the extraction from the wheat (and possibly also the oat), and for releasing free amino nitrogen to aid in fermentation. I also adjusted the rest of the mash schedule to mimic that used by Orval, using a first step at 142F for 15 minutes, followed by a step at 154F for 25 minutes, then a step at 162F for 30 minutes, followed by mash out at the Zymatic's default 175F. I even added a quarter teaspoon of amylase enzyme to the mash to help improve conversion. I'm hoping to do much better than the previous 54% brew house efficiency last time around. I also added yeast nutrient to help the yeast survive and thrive in its new home once pitched. Combined with the rest at 113F and other changes, I'm hoping it's a very well-converted and fermentable malt. 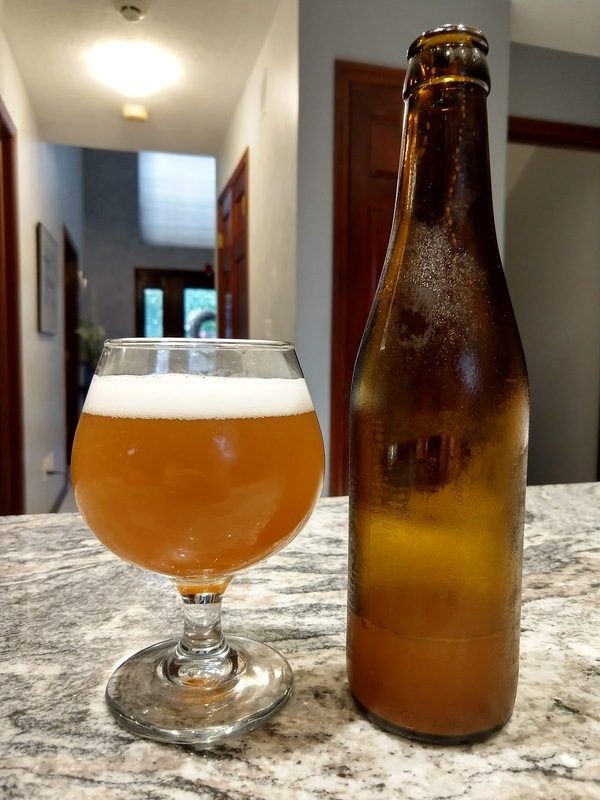 The choice of the Sweet Mead Yeast rather than a Belgian ale yeast was driven by the Candi Syrup Inc. recipe for a Karmeliet clone, as well as some forum postings suggesting that this yeast produced a flavor profile similar to the real beer. Other yeast strains suggested were Wyeast Forbidden Fruit and White Labs WLP500. I may try those if this recipe doesn't come out as intended. The tube may have helped, as there was no foam-over or spillage on this batch, but that could also have been due to the smaller grist. I also added some amylase to the grist to help the starches convert during the mash. I don't know if it helped, but the previous batch had a brew house efficiency of 54.2% while this batch managed 62.7% efficiency. Those are not great numbers, but 9 pounds of grain down to 7.5 was probably a big factor as well, as the Zymatic seems to do better with smaller grain bills. 06/10/2018: By midnight, I heard signs of airlock activity, which was earlier than I expected to hear any. Then again, the mash schedule, yeast nutrient, and good aeration all make for very good yeast growth conditions - so perhaps the yeast are just happy in their new home. A taste of the wort when the original gravity reading was taken yielded a clear but pleasant lemon character. If this carries through to the finished beer, we may have a winner. 06/11/2018: The Tilt is reporting that the beer's gravity has dropped from 1.086 SG to 1.059 SG. The temperature has dropped from 74F at pitching to a low of 71F and back up to 75F at this writing, which is the top end of the yeast's ideal range. 06/12/2018: Last night, the beer briefly reached 76F. At the time, I wrapped a damp towel around the stainless fermenter. Soon it dropped back down to 75F and later 74F. Today, the gravity is down to 1.046 SG and the temperature is 68F now. Since the yeast works best between 70F and 75F, I attached a fermwrap heater to keep it at 71F for the next three days, then raise it to 75F. 06/13/2018: The heat wrap and temperature controller have kept the beer at a near-constant 71F since I attached it yesterday. The gravity has dropped from 1.046 SG yesterday to 1.034 SG as of this writing. That represents 59.6% attenuation and a current ABV of 6.7%. The gravity began leveling off around 4pm yesterday, but is continuing to drop. The expected final gravity for this batch is 1.020 SG, which is just 14 points away from its current gravity. If the last 24 hours are any indicator, gravity should drop to around 1.029 SG tomorrow, and reach 1.020 SG some time on Friday. We'll need about three days to ensure that this is the terminal gravity, which means bottling probably won't happen before Monday unless the yeast is finished sooner. 06/14/2018: The gravity is down to 1.030 SG as of this writing, sometimes dipping down to the 1.029 SG I expected to see tonight. I've adjusted the fermentation temperature controller to raise the temperature up to 74F for the rest of fermentation, to give the yeast a chance to finish out. A sample pulled from the fermenter was a very pale cloudy straw color, reminiscent of the real Tripel Karmeliet. The aroma was slightly fruity, and vaguely citrus-like. The flavor at this point is pleasant, with only the vaguest hint of lemon. Since the yeast is still active, there was a bit of sulfur as well. While it's definitely thinner-bodied than the last version, it isn't light-bodied by any means. 06/15/2018: The gravity is down to 1.029 and has been holding at this figure since earlier today despite the temperature being increased into the yeast's upper range. The Raspberry Pi doing the monitoring apparently crashed early this morning and stopped monitoring around 8 am. Despite that, the gravity hasn't changed for several hours. Fermentation might be nearly finished. 06/16/2018: The gravity has held steady at 1.029 SG now since 11pm Thursday (6/14). The temperature has varied between 74F and 77F, which is near or above the top end of the yeast's recommended fermentation range. I'm hoping this will allow it to ferment out any remaining sugars before cold-crashing and bottling. 06/17/2018: Today, after seeing no change in gravity or airlock activity for three days, I bottled the beer using five small carbonation tablets ("high carbonation") per bottle. Yield was 26 bottles. Somewhere around 6/24 we should have some idea how this recipe is shaping up. 06/24/2018: The beer is nicely carbonated now and any trace of diacetyl or other off flavors related to carbonating no longer exist. The aroma is sweet and citrusy, though it's not the nice bright lemon aroma of a real Tripel Karmeliet. My wife picked up banana and clove in the aroma, which I did not. The body of this version is lighter than the last, getting it closer to the real Karmeliet beer, though it still seems a bit more full-bodied than a tripel should be. The flavor is malty, sweet, and fruity with a hint of lemon and coriander, though the lemon in this is more like a lemon candy where the real Karmeliet's lemon flavor is more like fresh lemon. That may be because this version is somewhat sweet, or because the Lemon Drop hops are shifting the flavor more toward candy than real lemon. Either way, this is actually a really good tripel. If I was making this again, I think I would further dial back the wheat malt and maybe switch from Lemon Drop to another lemony hop variety. 06/25/2018: I labeled the bottles tonight so that I can begin sharing them with friends and family. 07/03/2018: Tonight I tried this beer on draft for the first time, and it was a very different experience from the bottled version. This recipe is actually very close to the draft version of Tripel Karmeliet, although very different from the bottled version.